Reader's Digest Association, 9781621452690, 256pp. Follow the inspirational journey of a former stockbroker who leaves his unfulfilling desk job in search of a meaningful life. He sets out from Los Angeles on a vintage motorbike, determined to circumnavigate the globe surviving only on the kindness of strangers. Incredibly, he makes his way across the U.S., through Europe, India, Cambodia, and Vietnam, and finally to Canada and back to the Hollywood sign, by asking strangers for shelter, food, and gas. Again and again, he's won over by the generosity of humanity, from the homeless man who shares his blanket to the poor farmer who helps him with his broken down bike, and the HIV-positive mother who takes him in and feeds him. At each stop, he finds a way to give back to these unsuspecting Good Samaritans in life-changing ways, by rebuilding their homes, paying for their schooling, and leaving behind gifts big and small. 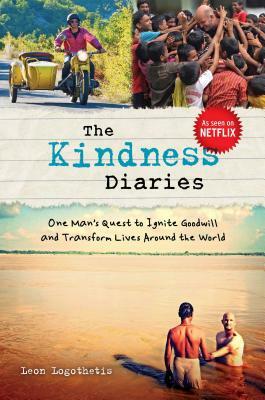 The Kindness Diaries will introduce you to a world of adventure, renew your faith in the bonds that connect people, and inspire you to accept and generate kindness in your own life. Leon Logothetis is a TV host, producer, author, traveler and all around good guy. Formerly a London broker, he gave up his comfortable life to travel and find real human connection. He is the host of "The Amazing Adventures of A Nobody" which was licensed to National Geographic International and aired in over 100 countries, including in the United States on Fox Reality Channel and Canada's OLN. He is also the author of a book by the same title. He has appeared on Good Morning America, CNN, FOX, BBC among other mainstream media outlets. He runs a production company called Principal Media and lives in Los Angeles, CA with his dog Winston.